ConocoPhillips (COP.N) said it’ll receive US$2 billion in a settlement with Petroleos de Venezuela SA, ending a dispute that’s severely crippled Venezuela’s ability to export the crude oil central to its faltering economy. An international tribunal awarded the amount in April for asset seizures carried out in 2007 by late Venezuelan President Hugo Chavez. Under the agreement announced Monday, state-owned PDVSA will make initial payments of about US$500 million within 90 days, with the balance paid quarterly over four and a half years, Conoco said in a statement. The US$2 billion represents about a quarter of international reserves held at Venezuela’s central bank. PDVSA is behind on US$6.1 billion in bond payments to creditors, and a judge in Delaware recently granted Canadian miner Crystallex the right to seize shares of U.S. refiner Citgo held by a Venezuelan parent, though the decision is being appealed. If Conoco doesn’t get its money, “the company can resume global enforcement actions" and “enforce the settlement agreement in all jurisdictions," spokesman Daren Beaudo said in an email. “The agreement was developed in good faith, and we believe we have fashioned terms that are reasonable yet fully enforceable." Conoco shares rose 1.1 per cent to close at US$70.52 in New York Monday. Messages seeking comment from PDVSA weren’t immediately returned. Under the settlement, Houston-based Conoco said it will suspend legal actions it had mounted worldwide, including in the Dutch Caribbean where about 16 per cent of Venezuela’s crude exports are stored before shipping to the U.S., China and India. The pact comes days after Venezuela President Nicolas Maduro devalued the bolivar to trade nearly in line with the black market exchange rate in the latest attempt to deal with the country’s crippling economic woes. The legal war waged by Conoco, in addition to U.S. sanctions, has severely hampered PDVSA’s ability to export crude, the commodity that bankrolls Maduro’s regime. The settlement could potentially slow the decline in Venezuela’s oil production, Clearview Energy Partners LLC said in a note to clients. Output fell from 1.61 million barrels a day in January to 1.26 million last month, according to the International Energy Agency. For Conoco, the settlement could help the driller accelerate share buybacks -- a key demand of investors -- and fund increased capital spending on its drilling budget, Bloomberg Intelligence analysts Fernando Valle and Jonathan Mardini said in a Monday research note. 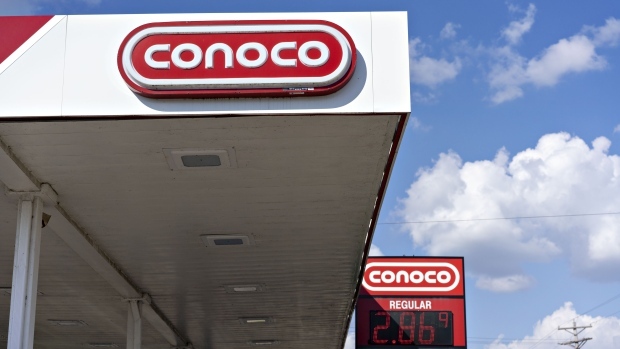 The deal “brings Conoco one step closer to a full resolution for this settlement and removes some doubt around the timing and amount Conoco might recoup," Scott Hanold, an RBC Capital Markets analyst, said in a note Monday. “We are increasingly optimistic the company will successfully recover the full amount." After the international tribunal in April awarded Conoco US$2.04 billion, the company moved to take over oil facilities on the Caribbean islands of Bonaire, Curacao, St. Eustatius and Aruba. The moves created a hurdle for exports even as Venezuela’s domestic troubles cut into production at PDVSA, further hampering the country’s ability to raise cash and pay off its debts. Vessels were ordered to immediately pull away from Caribbean ports, creating a backlog of ships around Venezuela. Unable to load in the Caribbean, PDVSA instead loaded oil tankers via ship transfers off the coast, which partly alleviated the problem. The state-controlled company also boosted sales to the U.S. in smaller Aframax-size vessels, which limited it to smaller shipments but reduced its dependency on supertankers loaded in the Caribbean. In addition to ConocoPhillips, PDVSA reached an agreement with NuStar Energy LP, the San Antonio, Texas-based company said in a statement Monday. The Venezuelan oil company, which fell behind payments for the leasing of oil storage tanks in St. Eustatius, signed an accord bringing the account “current,” NuStar’s spokesman Chris Cho said in an email. As part of the new storage agreement, PDVSA is reducing the leased storage space, he said.